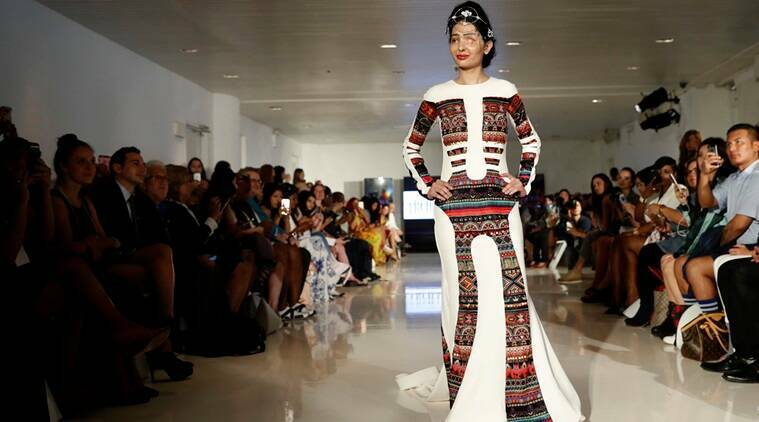 Reshma Qureshi, who was attacked by splashes of acid all over her at the age of 17 in the year 2014, has successfully survived the attack and has created a heart throbbing momentum for thousands of those waiting for her among the audiences by ramping down the New York Fashion Week on Thursday. Once on a walk with her sister she suspected few men following them while carrying a liquid in a polythene bag. She thought that the best way of protecting themselves in a situation like such would be by snatching that polythene bag from them. Regrettably, the liquid splashed from the bag onto her face and hands making her loose her left eye. During recovery, after one catastrophic year, she decided to be an idol for similar such survivals by launching the campaign ‘MAKE LOVE NOT SCARS’, a not for profit organization that focuses on provision of funds for nurturing the ones-dead-souls. Under this, survivors are given funds for their education and basic survival needs complimented with immense job opportunities. Reshma Qureshi, now 19 years old, says, “It is as easy to buy acid as it is to buy a lipstick”, focusing on the fact that while you would be busy spoiling others, she would be busy perfecting her own. Her zest to live again has created a divine influence on millions such souls stating that no matter what happens opportunities never end. She gave off a strong message at the fashion week to those who judge based on looks and appearances. Learn From These Ladies How Your Clothes Portray Your Power!